Another protest against the actions of the capital’s authorities regarding the reorganisation of the ethnic minority schools took place on the 15th of September. Teachers of Polish and Russian schools came to the demonstration that took place in front of the Vilnius City Council building at the Konstytucji 3 avenue. The teachers from Szymon Konarski Secondary School, institutions situated in Lazdynai eldership, Lew Karsawin Secondary School and “Centro” Secondary School issued a petition to the city’s Mayor. “We are doing this demonstration because we are continuing the fight for our rights, for preservation of our schools”, said Leonora Kadevičienė from Szymon Konarski Secondary School for “Kurier Wileński”. On the 29th of July the Vilnius City Council approved the resolution number 1-127 about the reorganisation of 9 Vilnius secondary schools which meant that they would be transformed into primary schools without classes 11 to 12. The resolution was accepted against the amendment to the Law on Education from the 30th of June 2015 which allowed the realisation of the secondary education programme until the 1st of September 2017. “We were informed about the Council’s decision a month before the beginning of the school year which is a violation of law according to which such decisions must be made at least four months before”, said Leonora Kadevičienė. “Then we received a message that the children can continue to learn our school. Before the beginning of the school year the students have already begun coming to school, thinking about plans and projects, they started making plans regarding celebrating Teacher’s Day. Suddenly, on the 31st of August we are informed that there will be no classes 11 to 12. In the evening, around 17:00 we were told to notify the parents and the students to ‘not come to the Konarski school, but to search for another one’”. On the 1st of September all of the students, including those from classes 11 and 12, attended the assembly regarding the beginning of the new school year. They did not hide their anger. “The fact that the students still came here proves that they want to learn here. Most of my students live outside the city and have other schools situated closer to their homes. They have knowingly chosen this school and they want to learn exactly here. If they did not care about this school I am sure there would even be no talks about classes 11 to 12”, said the pedagogue of the 11th class Leonora Kadevičienė. “Here we have students which parents and grandparents also finished this school and they care about its survival”. The decision of the Council regarding the Konarski school and Lazdynai schools was sued in court. The judgement will be stated on the 5th of October. “For now we are learning in our school. The Mayor Šimašius visited the school last week and assured the students that they will stay in the same school and the same teachers will teach them. They will only have a different school written on their school-leaving certificate. We are actually learning here and practically we belong to the Adam Mickiewicz Gymnasium”, informed the teacher from the Konarski school. Verbal procedures of “convincing” schools to undertake actions regarding reorganisation are also a violation of law. The Council does not issue any written instructions or documents which the schools could use in order to realize the local-government’s decision. Did the Mayor explain how the issue of the students “basket” and the teacher’s pay will be resolved? “The Mayor explained nothing. He arrived without any notice, entered the classrooms and told the students what he had to tell. I asked him who is responsible for the students in that situation, he could not answer. He did not explain anything in particular. We do not know what will happen to us”, said the 11th class pedagogue. “We protest against the actions of the city’s authorities regarding not allowing in the last moment to complete classes 11 to 12 in some ethnic minority schools. Everyone: the teachers, students and parents are anxious about tomorrow and are living in enormous stress. The students are worried how will they cope with learning in this situation, what school-leaving certificates they will get. The teachers are worried if they will become unemployed and if they can think about changing a place of work in this situation. The parents are thinking about enlisting their children to a different school”, said another teacher from Władysław Syrokomla Secondary School. “We are at this demonstration because the problem of accreditation is very actual for us”, said the teacher from Władysław Syrokomla Secondary School. “A 6 person commission came to the school by the order of the Minister of Education. Very serious, competent people. They have done a lot of work. They checked whether the school fulfils every condition in order to get accreditation. They verified if we have an appropriate number of students and checked their achievements. Their second task was to inspect how we apply the concept of a catholic upbringing. The commission did their work, but they did not send any written answer. The fate of the Syrokomla school depended on this answer. The results of the commission’s inspections were to be given on the 19th of June. “We still have not received any report. We wrote to the Ministry with a request to send us the results of the inspection. We came to the demonstration to clarify our school’s situation but also to defend other schools”, said the pedagogue. “We believe that the actions against which we protest are a serious violations of the teachers and students’ rights but also simply human right. You cannot do this in a democratic country”. 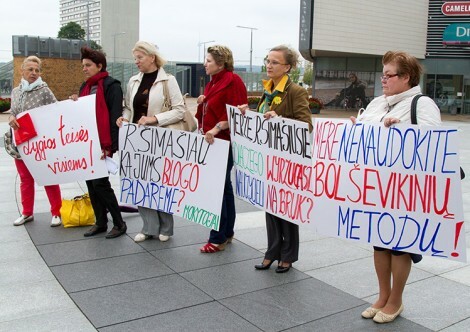 The strike’s participants addressed the Mayor, Remigijus Šimašius, with a petition in which they accused him of destabilisation and disorganisation of the schools’ work with the demands of an as quick as possible compensation. “Because of your irresponsible rules the ethnic minority education in Vilnius is being destroyed”, is written in the petition.